"God is great. God is good. Let us thank Him." This was the theme that the University President had set for what was going to be my freshman year of college. Growing up in a Christian home, going to a Christian school, and now on to a Christian college, this was something I knew. Something that I probably even took for granted. But did I really believe it? Am I really putting it into practice? And it was not until December, 2010, that I had to find out if this was more than just a trite Christian mantra. As December, 2010, approached, we were anxiously awaiting a new arrival to our family. After 3 boys, we were finally having a girl. Needless to say, I was quite nervous. I grew up with 2 brothers. I had 3 sons. I didn't know what I was going to do with a little girl in the house. And Pam was looking forward to no longer being the only female in the house (or as she referred to it, "a locker room, with a refrigerator"). Then, in the early, early morning hours of December 1, the days were accomplished that Pam should be delivered, and Hannah was born. As we was in the hospital that morning, admiring this beautiful girl that God had entrusted to us, a doctor and nurse entered our room. They were rather blunt. Bedside manner was not necessarily their strong point. They told us, that due to some of the physical characteristics that they saw in our daughter, they believed that she Down Syndrome. Needless to say, this news hit like a ton of bricks. Here we are, with a newborn daughter that was not even 6 hours old, being told that she has an incurable genetic abnormality. While this should have been a time of rejoicing, it became a time of fear and uncertainty. I asked myself "Why us?" What did we do to deserve this? This is something that only happens to other people. It can't really be happening to us, can it? They drew some blood to send it out for testing. We waited for what seemed like months to get the results. 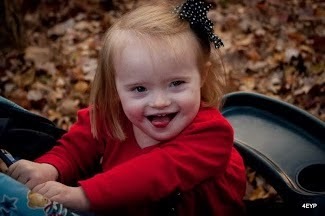 Eventually, after a week, the test results came back and confirmed what the doctor had expected - Hannah did have Down Syndrome. We struggled to accept this news. It was difficult. We did not know what we were in for. We hadn't prepared for this. How is this going to affect our lives? What are we going to do? After a few weeks, we finally let people know the news. The reception that we received after this announcement was overwhelming. We met people in the church who we had never spoken to before, who wanted to let us know that they had relatives with special needs, or that they worked with children with special needs, and that they would be more than willing to give advice, encouragement, and other kinds of help because of their experiences. We received encouragement in the form of cards and e-mails. Many let us know that they were praying for us. I can't begin to tell you how much that meant to us. It was encouraging. It was a blessing. It meant more than any of you could ever know. Over the years, we have continued to see your kindness towards us, and towards Hannah, and I can't tell you how appreciative we are of that. I want to thank those of you who have been Hannah's teachers. I want to thank those of you who have given us advice. I want to thank those of you who have given us encouragement. And I want to thank those of you who greet Hannah personally and make her feel welcome. Because of these circumstances, Pam has a job that she most likely would not have had if it weren't for Hannah. She is able to help others who have children with special needs. We both belong to several Down Syndrome support groups, where we have a chance to offer advice, get advice, and encourage others who are in the same situation. And without Hannah, I would not know what it is like to jump into 35 degree water on a 20 degree day in the middle of January to help raise money for Special Olympics. I would also like to thank God. We serve a God who wants us to have a relationship with Him, even though we fall short of His glory on a daily basis. I'm thankful for a God who forgives us when we ask for it. In America, when a Down Syndrome diagnosis is made while a child is still in the womb, the abortion rate is 80-90% (depending on the study you are looking at). In Iceland, the abortion rate under these circumstances is effectively 100%. Why? Because the child does not live up to someone's expectations. I'm so thankful that I serve a God that does not do the same thing to us when we fall short of His expectations for us. As we have seen from our Pastor's messages from the book of Judges, even though we fall short, God will forgive us when we ask for it. On December 1, Hannah will be 7 years old. The time has flown by. We couldn't be more proud of the person that she has already become. We can't wait to see how she continues to grow and develop. We look forward to what her future will be. After these past several years, with all of the ups and downs that we have gone through, I can come before you and honestly say that "God is great. God is good. Let us thank Him." Yes, this is an odd title for a blog post. Selfishly, it was meant to get your attention. With that being said, I do not mean for it be a negative thing. I want to express how things have changed for me, for the better, since we first received that diagnosis almost 4 years ago. I want to let people know that it is not just the parents who teach the children; we, as parents, can learn lessons from our children, too. This blog post is intended to express those things that I have learned from my daughter. It is meant to convey the lessons that I have learned and the truths that I have learned. I want to express those things that I already knew in the back of my head, but then were made real to me since she came into my life. It is meant to be an encouragement to others who feel that their world has been turned upside-down due to a similar diagnosis. It is so very hard to express the roller coaster of emotions over the first few days, weeks, and months of finding out that our daughter had Down Syndrome. It's not something that you ever dream would happen to you. You question why it happened to you. You contemplate what the next years of your life are going to be like, now that you have a child that requires special attention. You wonder how difficult your life is going to be. You wonder how much this is going to cost you, physically, mentally, and monetarily. You don't know where to turn to for help. You don't know who to turn to for help. How are her brothers going to react knowing that she will be different? How do you tell other people that she has Down Syndrome? What will they think about it? It really was difficult for several months. And then there were the Social Services that my wife worked with to help understand and aide in Hannah's development. They were very instrumental in helping Pam know how to work with Hannah to help her in her development (I say they helped Pam because she was the person at home with her through all of the therapy sessions. I was occasionally able to be there, but all of the thanks goes to Pam on this.). Pam then got Hannah involved with CATRA (Capitol Area Therapeutic Riding Association). It was there that Hannah learned to ride horses, which helped build muscle tone and helped with posture. There were so many services available to us to help us, when we had no idea how to move forward. And I cannot forget to mention the benefits of social media in all of this. Yes, you can read books, which contain a more academic look at Down Syndrome and development. But the wealth of first-hand testimonials on social media have been a tremendous blessing. It's great to be able to read stories from others about how their child is developing. It's great to be able to share stories about Hannah with them. It's just a very good resource for information sharing. And it is helps us to understand that we are not the only ones who are facing this situation. So, what have I learned through all of this, you may ask? The answers are many, and I can probably not name them all, or this would go on and on and on. But I can tell you that I have not stopped learning. I continue to learn new lessons, new truths, and new things about myself through all of this. 1. Hannah is a gift from God. Yes, I knew that anyway. But the issue is that I need to continue to remember that. We may not understand why God chose us as parents for Hannah, but she is God's gift to us. Psalm 139:14a says "I will praise Thee; for I am fearfully and wonderfully made:" Yes, even though, at times, we may focus on the imperfections, Hannah is fearfully and wonderfully made, too. 2. All life is precious. Again, I knew this. But I was alarmed to see the statistics on the abortion rate for unborn children who were diagnosed with Down Syndrome. Depending on the survey that you read, somewhere between 75-90% of all children diagnosed with Down Syndrome before their birth are aborted. That is sad. Life is precious. And people choose to play god with these unborn children because they do not fit into what they think is "normal." Shouldn't we, as Christians, be glad that God does not do away with us because we do not conform to what He wants us to be? A few months ago, a man by the name of Richard Dawkins said that it would be immoral NOT TO abort a child with Down Syndrome. How can a person possibly be so depraved to even let a thought like this go through his head, much less actually say it out loud? Life is precious. Just because someone does not fit into our idea of normal does not make that life any less precious. 3. Down Syndrome is not a death sentence. Many years ago, the outlook for people with Down Syndrome was not good. They were basically written off as members of society. They were not viewed as people who could contribute to society. They were viewed as a drain on society. They had a rather short life span, because they did not receive the necessary care. But over time, that viewpoint has changed. The average life span for a person with Down Syndrome has nearly doubled. We've learned that people with Down Syndrome can learn and can be productive. Tremendous advances have been made, and continue to be made. Last week, I read an article about a woman that wishes she would have had an abortion 47 years ago, had she known her son was going to have Down Syndrome. I wonder if she knows that people with Down Syndrome do have the ability to understand. I wonder if she ever told her son (who she says she loves) that she wishes he had never been born. You know, nothing says "I Love You" more than wishing death on that person. 4. People with Down Syndrome have the ability to learn. This was one of those things that I might have known, but didn't know that I actually knew it. There are so many stereotypes out there for people with Down Syndrome, many of which are just not true. Yes, they learn more slowly than others of their own age, but they definitely have the ability to learn. One only needs to see Hannah with our iPad or with my smartphone to realize that she can outdo many adults on one of those devices. She has learned sign language, which she uses as a means of communication. She knows more sign language than me, that's for sure. You can find many stories on the internet about people with Down Syndrome who have found success in life, whether it is as a business owner, a teacher, or even an MMA fighter. We cannot simply write-off people with Down Syndrome. They have a tremendous capacity to learn and grow. We just need to give them a chance to do so. 5. The love of a child is incredible. First, let me say that this does not mean that the boys do not love us. But love is expressed in different ways. Hannah will give me a hug before I leave for work. When I get home, she will greet me with a hug. When I pick her up as school or after Junior Church, she'll run to me and give me a hug. That's an incredible feeling that I just do not even know how to explain. When she does something that she's not supposed to and gets punished in some way for it, sure she's sad for a little bit. But in a few minutes, she'll come right back and give you a hug, forgetting that it ever happened. Wouldn't it be great if adults had that same sort of short-term memory? 6. There are people who are ready, willing, and able to help us when we need it the most. Again, something I probably knew, but just did not care about. As I said earlier, the family members, our friends and neighbors, people from church - they were incredible in helping us deal with the initial shock. We found out that several in our church had worked in environments with people with special needs. They were able to give us good information and advice. Our Pastor's wife read many books about Down Syndrome and gave us some much needed advice and encouragement in those early months. We were truly blessed to have a network of people who were there for us, to pray for us, to encourage us, to simply be there to talk to when we needed it most. 7. We are blessed. 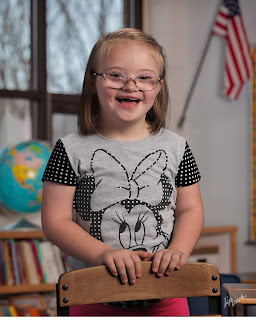 Hannah has not had many of the physical problems that other kids with Down Syndrome have. She wears glasses, she has tubes in her ears, and she had to have her tonsils removed. But these are things that many parents of children who do not have Down Syndrome have to go through, too. We constantly hear stories of children, whether with Down Syndrome or not, who are stricken with life-threatening diseases and injuries. We have not had to face anything like that, and for that, we are truly blessed. I could probably go on and on. But you get the idea. We are blessed to have a child that we love, and who loves us back, unconditionally. The diagnosis of Down Syndrome did not bring the world, as we knew it, to an end. Instead, it opened up our world to opportunities that we never even knew existed. Let's go back to 1985. Coca-Cola was losing some market share to Pepsi. Coca-Cola, in order to try to regain market share, came up with what is considered to be one of the biggest marketing mistakes in the history of marketing - they re-formulated the ingredients in Coca-Cola to try to make it taste more like Pepsi. Needless to say, it failed miserably. The people at Coca-Cola thought that since Pepsi had gained some market share, the best way to get it back would be to change your drink to have it taste more like the competition. Well, the Pepsi drinkers were not going to change their drink of choice. Why should they? If they liked Pepsi, why would you change over to a soda that was trying to imitate what you already liked? 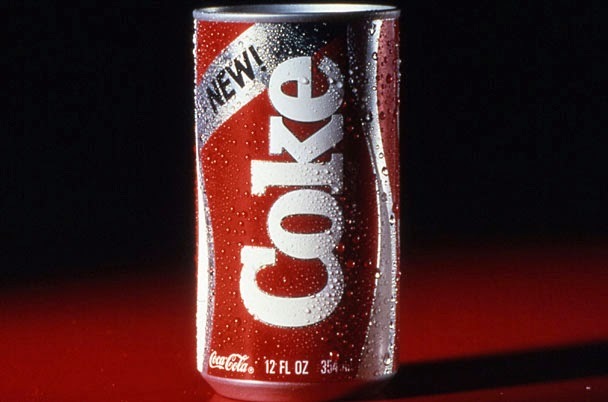 Coca-Cola drinkers were mad, and would not purchase the new product because they liked the old formulation. If they would want to drink Pepsi, they would buy Pepsi. The last thing that they wanted was for their favorite drink to taste like the competition. This marketing failure of almost 30 years ago is now being repeated by the Republican party. Over the past several years, Republicans have viewed it in their best interest to think like and act like Democrats. Instead of standing on the principles and the beliefs that got them into power, they have sought to compromise those principles in order to gain "market share" in the political world. Amazingly, Republicans used to win elections based on their principles (just go back to Reagan, as well as the Contract With America). But somewhere along the way, Republicans saw Democrats gaining ground, and thought that they needed to become more like them in order to win elections. Here is the problem that the Republicans now have. They are trying to become more like the Democrats in order to try to curry favor with the Democrat base. But those Democrats are not going to vote for Republicans. For one thing, they probably don't trust the Republicans. But why would they vote for someone who is trying to be like them? They will just vote for the real thing. In this example, the Democrat Party is like the Pepsi fans. The other problem is that the conservative, Republican base will not vote for them. They do not like the fact that these officials are so willing to give up their principles in order to be like the competition. They do not like that these officials are willing to sell them out in order to try to gain a few more votes. The Republican base are the Coca-Cola diehards. So, when will the Republican establishment leaders learn from this terrible miscalculation? The problem is that they are deaf to the complaints coming from their own party. They listen to the media and the Democrat Party when trying to "fix" the GOP's problems. They continue to push deficits and spending and amnesty and other liberal issues, even while their constituents are loudly protesting these actions. At least the Coca-Cola management relented, and went back to the original drink formulation, because they started to lose even more ground to Pepsi. I am not sure that the GOP establishment leaders are smart enough to do the same thing. Just ask John McCain how well this strategy works. When he ran against George W. Bush in 2000, he was the media darling on the Republican side. He catered to them and moderated his views, and the media wanted him to be the Republican candidate. They couldn't get enough of him (even thought the rest of us has more than enough of him). Fast forward to 2008 when McCain ran against Barack Obama. He was not the media favorite any more. In fact, they did whatever they could to sink him. So much for being a fan favorite. This is just one of the reasons that Republicans need to stop trying to be like the Democrats. People that you think are on your side really are not - they'll stab you in the back at a moment's notice. Also, there were many, many Republicans who did not vote in the 2008 election (even though I believe McCain might have been a slightly better President than Obama) because they felt that they were sold out. Now, the Republican Party continues to push amnesty. Some may be doing it out of the pretense that it is the right thing to do, regardless of politics. But the overwhelming majority of them are doing it because they see millions of potential Republican voters becoming citizens. This idea is foolish, because that is one thing that is not going to happen. The Tea Party was established several years ago as a grass roots movement to protest the way that the government was headed and to show that there are indeed a lot of conservatives in this country. It was also to protest the Republican Party, which was leaving their base behind in order to try to be more progressive. Apparently, the leadership of the GOP has yet to understand this, as they continue to brush aside the Tea Party. Why would they brush aside those same people that helped them get into office in the first place? The answer to the GOP's problem is that they need to do what the Coca-Cola management did after they made their near-fatal mistake - get back to the original formula that made you the leader you were in the first place. Otherwise, they will continue down a path to eventual destruction. I have not posted much to my blog over the last year. I can't exactly pinpoint any particular reason for it. Some of it is due to laziness on my part - I just didn't feel like taking the time to do it. Some of it could be the fact that I was annoyed with our nation's leaders that I didn't know what to post and what to leave alone (after all, there was so much to comment about). Some of it is due to the fact that my posts do not automatically post to Facebook, and I did not want to take the time to write a blog post and then link it to Facebook (it seems so self-centered, I know). Some of it is due to just being able to post a link to a news story on Facebook and then making a couple of snide comments about the article. The truth is that there were just a variety of reasons that I could give for not posting anything. But I would like to get back to posting more about what is going on today, whether it is just local news, politics, sports, celebrity news, or just anything that garners my interest. So often, we complain that out voices are not being heard. Well, this is a chance for my voice to be heard, even if only by a small audience. Maybe, the right person will see my blog someday and that will vault me into some sort of popularity. Who knows. In the meantime, enjoy my thoughts and opinions on what is going on the world around us. And feel free to comment if you see fit to do so. Last Sunday, December 1, I lost a good friend - Tim Coomer. I must admit, I was stunned when I received the news. Tim was a good Christian man, a teacher, a husband and father, and a friend to many. It was hard to fathom that he was no longer with us. I first became friends with Tim several years ago when I was asked to join a fantasy football league with several other men from our church. I didn't really know Tim before that. At first, the trash talk bothered me, and to be quite honest, he annoyed me. But as the weeks went on, I started to realize that Tim was just having fun. He was enjoying the league, and he wanted us to enjoy it, too. And while the league was all about fun and camaraderie, he was still very competitive. He won the championship that year, and the next year. He then won it again a few years later. He never passed up an opportunity to let anyone know that he won the league championship 3 times. Along with the fantasy football and the trash talking, there was the friendship and fellowship that he enjoyed. He would hold a fantasy football draft party at his home. He would hold an end-of-the-year party at his house. My family and I would be able to join in these fellowships on several occasions. He enjoyed being with people. And we, in turn, enjoyed being with him, and his family. Outside of the fun and frivolity of fantasy football, Tim and I had the opportunity to serve together on the Deacon Board for one year. This was a job that both of us took seriously. Tim was very sincere as a deacon. He was deliberate in the decisions that needed to be made. Tim and I enjoyed going back and forth on Facebook. I am sure that there were some innocent bystanders scratching their heads and wondering how the two of us could even be friends, given some of our Facebook conversations. I enjoyed "checking in" at various places, just so I could get a some kind of response from Tim. He would generally reply back with a comment like "thanks" or "I'm glad I know what you are doing. I was getting worried." If I we were eating out, I liked to take a picture of my meal and post it on Facebook, knowing that this annoyed him. I liked to find news articles about the failure of the public education system, knowing that he would have a reply indicating he disagreed with me. Yes, we had a unique friendship. Tim was a teacher, by trade. He enjoyed teaching. He had a passion for teaching. While I did not share his appreciation for the public education system in this country, I could tell from talking to him that he was passionate about his job. He wanted to help young people succeed. He wanted to help young people learn. He wanted to be a mentor and role model to these young people. He also enjoyed being a Sunday School teacher, for all of the same reasons mentioned above. But it was not until about 3 years ago that Tim and I forged a closer friendship. 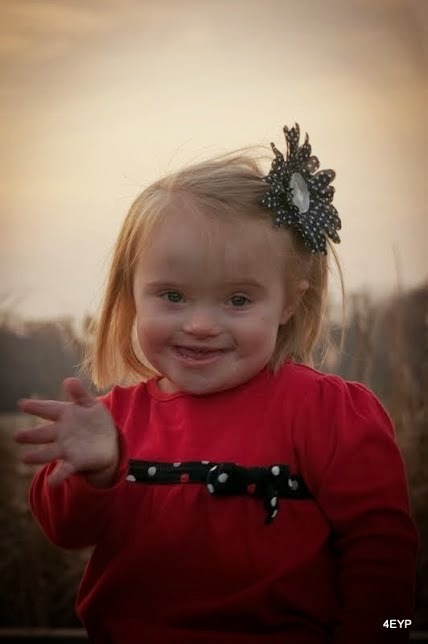 When my wife and I asked the church to make an announcement that our daughter had Down Syndrome, Tim was the first person that sent me a message. In what seemed like only minutes after this request went out via e-mail, Tim sent me a text letting me know that they were praying for us. He let me know that he was there if I ever needed to talk to anyone. He tried to encourage me that even though it seemed daunting at the time, we would be able to get through it. And over the course of the next 3 years, we spoke several times about this. He like to check up on Hannah to see how she was doing and advancing. He always had words of wisdom and encouragement. For the last few months of his life, Tim had some health problems. He was frustrated that they could not find the source of his health issues. He was frustrated that these problems were keeping him from church. He was frustrated that these problems were keeping him out of his classroom. I could see at this time that he really did have a passion for teaching. He had a desire to be back in the classroom with his students. It's been difficult to deal with the loss of a good friend. I would be lying if I said I did not miss him. I would be lying if I said that I have not shed some tears about this loss (and I do not think that this is a bad thing). But I do not need to dwell negatively on this. I can find encouragement in the fact that Tim was a born-again Christian. Because Tim knew Jesus Christ as his personal Savior, I will be able to see him again in heaven. I can find encouragement in the fact that Tim is no longer suffering from any physical problems. While his last few months on earth were spent in some serious pain, he is now in the presence of the Great Physician, who is watching over him and caring for him. I can find encouragement in the fact that even though his death was sudden, his life had a lasting impact on those around him. Because of his faith and testimony, at least 20 people accepted Christ as their personal Savior at his memorial service. I am encouraged to know that, even in times of grief and mourning, Jesus cares about us. This is captured in the words of a song, written by Frank Graeff. I recently finished the book The Fourth Apple Tree by Joseph Scotto. It is a very interesting book about a boy's summertime adventures with his friends. It also tells of the boy's search for truth. What is very interesting is that you see a kid that just finished 6th grade, searching for truth. It's rather amazing, considering many adults search for truth and don't seem to find it. The author, Joseph Scotto, is a former teacher of mine. He was my teacher for Biology, Advanced Biology, Chemistry, Physics, German II, and he filled in for a while as my Geometry teacher. He is a Christian man, and his lifestyle reveals that. He wrote this book as a novel, as fiction (which is somewhat odd, considering that this book is about the search for truth). Yet he admittedly uses many actual circumstances in his own life to tell this story. Let's just call it autobiographical fiction. I cannot help but think (because I really do not know) that the search for truth is the actual story of how he found Jesus Christ as his personal Savior. The storyline surrounding this truth is filled in with intimate details of the games they played, the emotions that they experienced, the exploits they pursued, and the "enemies" they made that particular summer of 1968, which were probably made up to some degree to fill in the details. The book starts out as school lets out in late spring of 1968. Joe and his friends are playing "The Game," an amped-up game of tag. They play this game this throughout their neighborhood. Sometimes, the storyline gets tediously detailed in its description of "The Game," but you get a sense of the personalities and character of Joe and his friends. Throughout the book, Joe and his friends play this game often. They also play little league baseball. The group of friends play on different teams, but they all come out to support each other. The author also uses baseball to help to reveal the character of Joe and his friends. The author also shows how the proverbial bench-warmer, Joe, uses his time in the dugout, as well as 1st or 3rd base coach, to think about his search for the truth and to ponder the events going on around him. While at a baseball game, Joe's brother, Phil, has his bike stolen. Joe, along with Steve, and the rest of the group, try to find who stole Phil's bike and what they did with it. Along the way, they find out that the group that stole Phil's bike has also stolen many other bikes and are moving them around the neighborhood trying to hide them from everyone, including the police. They also discover that this group of bike thieves is dealing marijuana, which only complicates the situation. Joe and Steve spend a lot of time trying to spy on the bike thieves to find out what they are doing with the bikes. They want to turn these people into the police, but they need evidence of where the bikes are being kept. While the other friends are involved, Joe and Steve do the bulk of this spying. They are eventually caught spying by the bad guys, and are on the run from them for a good portion of the story. While Joe spends his time scared that these bad guys are going to eventually catch him and hurt him, he finds consolation in a place you wouldn't really expect to find it - with a former hippie named Larry. Larry was visiting a friend in Joe's neighborhood when Joe crossed Larry's path. Larry was talking about how he lived a life of drugs, but hit rock bottom and eventually found Jesus Christ and got saved. He is sharing his story with people in Joe's neighborhood. While many of Joe's friends laugh at Larry, Joe listens to him. This is what Joe wants - he wants to know the Truth. Joe and Larry cross paths a few more times that week, and Larry continues to share the truth of Jesus Christ with Joe, and whoever else he comes in contact with. This causes Joe to go home and start reading his Bible to find out who this Jesus is. As Joe read his Bible and talks with Larry, he has more and more questions. Quite remarkable, considering that this kid, who just finished 6th grade, is this involved in a search for truth when many adults don't even care about the Truth. Anyway, it wasn't until Joe thought that the bad guys were surely going to catch him, and he is running for his life, that he stops and puts his trust in Jesus Christ as his Savior. After this, a tremendous calm comes over him, because he knows that God will protect him. And this changes his perspective throughout the rest of the story. So, as the story comes to a conclusion, we find Joe and a couple of his friends in the dugout after a baseball game. The bad guys have them cornered. The bad guys want Joe and his friends to smoke some marijuana, and then they said they will let them go. Joe refused, even after his best friend, Steve, did it. Still trying to find a way to get away from these guys, Joe and his friends wait until the bad guys get distracted, and they make a run for it. Joe then goes and hides in the woods. This is where the 'fourth apple tree' comes into play. Joe knows these woods very well, and he navigates his way through the woods, at night, to get away from the bad guys who are chasing him. He finds a narrow corridor that leads him to this tree, the 4th apple tree. The people chasing him are not able to find this corridor, but Joe knows they are very close - he can hear them. Joe finds a place to hide at the base of this tree. It is a place where he finds comfort and protection. A place where he can pray to God for safety and delivery. A place where he can wait out the bad guys and experience God's protection. Eventually, the other friends who got away are able to contact the police, who then come and arrest the bad guys, and Joe is free to come out of hiding. While this would be a traumatic experience for anyone, especially someone of Joe's age, Joe uses the situation to draw closer to God and rely on Him for safety and protection. Throughout the story, we see how Joe's curiosity about the truth led him to a real search for the truth. We see that even though Joe's friends did not take Jesus seriously, Joe still wanted to know more about him. He avoided the negative peer pressure in order to pursue this truth that he was longing for. We see how people can be used to further the cause of Christ. No one would think that a hippie would be a good witness for Christ, but it was because of him that others came to know Christ. God can use anyone. And we can see that knowing God can give a Christian peace that only God can give, even in the face of difficulty. While Joe's human emotions of fear want to take over at the end of the story, he prays to God and relies on him for his protection. How much can we learn from this 12-year old kid who turns his life over to God and relies on him for protection from his enemies? We would all do well to follow his example. This book is long (501 pages, to be exact). While at times it was tedious reading (in describing "The Game" or talking about nearly every pitch in a baseball game), the overall storyline will hold your attention. As I got into the book, I wanted to continue reading it. It did not get boring. It held my attention, and I continually wanted to come back to find out what was going to happen next to Joe and his friends. I congratulate Joe on his 1st novel, and look forward to a possible sequel. As we continue to watch the events in Newtown, CT, we are saddened for the needless loss of life. We are saddened that 26 people were killed by a man who was most likely out of touch with reality. We are saddened that these families have to go through such agony and grief. Instead of these families sharing the Christmas season opening gifts and spending quality family time together, they will have the unfortunate task of burying a child during a time that is supposed to be filled with joy and happiness. As Americans, we find the slaughter of 20 innocent young children and 6 adults to be an atrocious act committed by a completely deranged person. How could anyone do something so horrendous? To what depths of depravity can someone reach? As horrendous as the murders of these children are in our eyes, it pales in comparison to the greatest massacre that we face today. And that massacre is abortion. We should not have to see even 1 case where a child, or anyone else for that matter, is murdered in cold blood. Yet, the unborn are aborted every day by the thousands, in cold blood, and no one bats an eye about that number. In Newtown, there were 26 people murdered in cold blood. Since the legalization of abortion in 1973 in the United States, there have been more than 50,000,000 innocent, unborn children murdered through the medical procedure we know as abortion. Yet, no one is on the news today, talking about the number of children that are aborted each and every day. For some reason, our society today does not seem to have a problem if we kill innocent children, so long as they are still in the womb. I, for one, would love to know why a child outside of the womb is more valuable than the potential of the child that is still in the womb. We even have the terrible procedure where a child is allowed to be partially born, then killed before it is completely out of the womb, a 'procedure' we know as partial-birth abortion. And while there are pro-abortion people who are against this procedure, there is still considerable support from the pro-abortion movement for this kind of child-murder. Our society has killed off the unborn at an alarming rate. And while the numbers have slowed down a little bit over the last 10 years, we are still aborting close to 1,000,000 unborn children every year. While the pro-abortion crowd cheers the fact that there are not as many abortions, the pro-life crowd continues to mourn that there is even 1 abortion every year, much less 1,000,000 abortions. Abortion is an atrocity committed against the helpless, defenseless, unborn child. While we are appalled when someone goes into a school and kills children, or someone goes into a movie theater and randomly shoots and kills people, or we hear that a dictator in some third world country kills thousands and thousands of his fellow countrymen, why are we not as equally appalled when we find out that abortion providers have legally taken the life of millions upon millions of unborn children since the legalization of abortion? While we need to take time to stop and mourn for the loss of life in Newtown, CT, and pray for these families that are directly, and indirectly, affected by this tragedy, we also need to stop and pray that this senseless murder of the unborn comes to an end in this country. No society should accept the loss of innocent life, even if it is legal. Abortion stops a beating heart. It kills a living being inside the womb. The fact that this kind of act is legal is sad. The fact that there are people who do everything within their power to keep abortion legal is even sadder. The fact that we do not seem to care enough to do anything to stop it - well, that is a problem that we need to address. We need to stop abortion. Until then, our society, as a whole, will continue to devalue human life. Because if we do not even protect the most innocent and helpless among us, who will? On Friday, December 14, an unspeakable act occurred - 20 children and 6 adults were shot to death by a gunman at Sandy Hook Elementary School in Newtown, CT. We look at this act in utter disbelief, trying to understand why someone would do this. To take a gun and use it to kill 20 helpless first grade children and 6 teachers who were doing what they could to protect these children. We cannot help but mourn the tragic loss of life in Newtown. There was absolutely no need for this. There are 20 families grieving for the loss of their 6 and 7 year old children. It is so hard to fathom what it must be like for these parents to have to bury their children, and it is happening only a week before Christmas. Usually this is a time of joy and happiness. It's a time to spend time with those closest to you. These families will now have to lay that aside and mourn over the loss of their children. There are 6 adults who perished in this massacre. By all accounts, they died trying to protect the lives of the students. They died taking heroic actions against a man intent on killing. These people died heroes. We read in John 15:13, "Greater love hath no man than this, that a man lay down his life for his friends." These teachers and administrators exemplified that Bible verse - they showed love to those children by trying to protect them, even to the point of giving up their own lives. Yet, just as the children who perished, these teachers are people who have families, who have children, who have parents. These families also mourn at the loss of their loved ones. We cannot help but mourn for the families that lost loved ones that fateful Friday. We cannot help but mourn for other school children, who lost their friends and siblings that day. We mourn for the teachers who lost their co-workers. We mourn for a community that lost 26 people to a senseless act of violence that did not have to happen. And because we mourn for these affected by this tragedy, we should not be ashamed to weep with compassion for them. Though maybe not considered to be a manly response, it is very understandable to want to cry for these families. After all, Jesus Christ wept when his friend, Lazarus, died. He wept, not only for Lazarus, but for His people and Jerusalem. If it is OK for Jesus to weep, then I have no problem being able to weep in the face of unspeakable tragedy. The people in Newtown, CT are experiencing unspeakable tragedy. We weep with them because we see the tragedy that others must now face. We weep because we see what unbridled evil is able to do in the heart of someone who allows it to be there. We weep for the senseless loss of life. We weep because there are those who do not necessarily mourn over the loss of life, but how they might be able to use this event to further their own selfish, political ambitions. But as we mourn, and as we weep, we must also pray. We must pray that those who are so closely affected by this tragedy are able to mourn. We must pray that these people are able to heal. We must pray for our schools, that they will be able to keep our children safe. We must pray for our nation, that we do not lose sight of the fact that we need God's guidance and protection, not just in our schools, but in our communities and in our homes. It's hard to understand why these things happen. Why did God allow it to happen? How could He let this happen to children? How could someone be this evil? What drove him to do it? We may never find out the answers to these questions. We can look up Bible verses all day long. We can ask the most learned among us. And we may never know the answers. But I think we can take solace in the fact, that even though horrendous events like this happen, God still loves us. He loved us enough to send His Son to die for us. I think we would be wise to look at the words of a song written by Marsha Stevens, and heed them. And I strove to remind you that for those tears I died. I also think that we should not be afraid to talk to our kids about this kind of tragedy. While most "experts" believe that you should not do this, it is important for our children to know that evil exists. It's also important for them to know what it is like to mourn for others, to have compassion for others, to pray for others. We also need to show love to our children. We need to love them, hug them, cherish them. We just don't know how much longer we have with them. It seems so hard to believe that Saturday, December 1, will mark Hannah's 2nd birthday. Where did that time go? It seems like only yesterday that we were bringing her home from the hospital. Of course, at that time, we had no idea what our lives would be like. 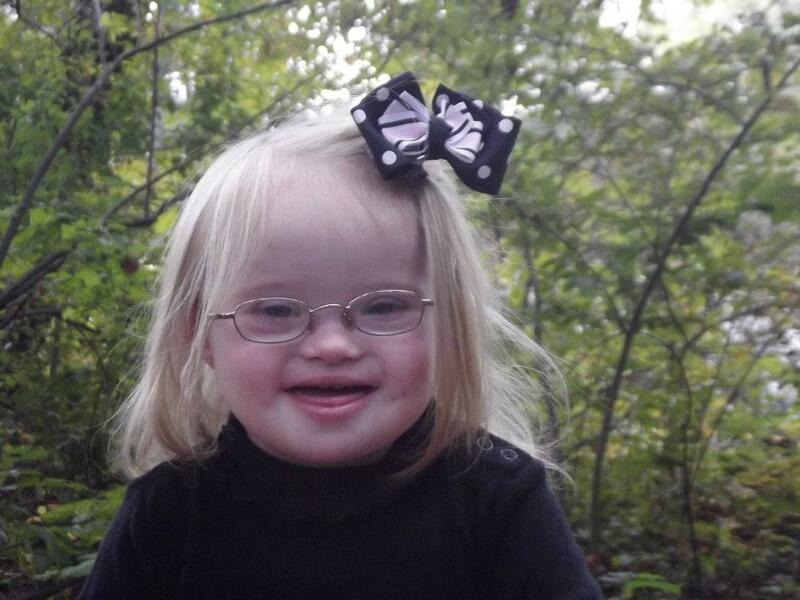 The preliminary diagnosis at that time was that she had Down Syndrome. Further test results that we received a couple of weeks later confirmed the initial diagnosis. Our lives were overflowing with fear and trepidation. We did not know what to expect. Needless to say, we went through a myriad of emotions. The first couple of months were overwhelming. We had so much to learn. We had so many specialists that we needed to see. It seemed so surreal. It seemed as though we were living in some king of dream world. Our reality had been turned completely upside-down. We knew our lives were going to change by finally having a little girl in the house. We just had no idea that our lives would change this much. As time went on, we didn't need to see as many specialists. We had more knowledge of Down Syndrome. We had developed a network of people who either had people with Down Syndrome in their family or had worked with people with special needs. I'm thankful for our Pastor's wife who went out and purchased books about Down Syndrome, and read them, and encouraged us with what she was learning. What a blessing it was for these people who had offered us advice and words of encouragement. Looking back, we have been blessed. Hannah has not had any serious health problems. Yes, she wears glasses, and for the most part, she does leave the glasses on her face. She had to have tubes put in her ears, which definitely made a difference in her hearing, as well as her overall balance. And she has braces that she wears to help strengthen her ankles. Other than this, she has had no other health problems. It definitely could have been much worse, and we are truly thankful that her health has been good. While her development has been slower because of Down Syndrome, we could not be happier with the progress she has made this far. She is finally starting to let go of the furniture and starting to walk. While she does not make it across the room, she is getting better and going farther day by day. And hopefully, in the next couple of weeks, she'll be walking all over the house. Just think of how much fun she'll have tearing the decorations off of the Christmas tree. Pam has been teaching her sign language. We have a couple of sign language videos for kids that she watches, and Pam reinforces those signs with her. Hannah has even been able to teach me a couple of signs. I now know how to say "please" and "thank you" in sign language. Granted. that's not very much, but it's a start. She continues to see a couple of developmental therapists, and when the new year rolls around, she will be seeing a speech therapist. I am not able to be involved in this part of her life, as these therapy sessions usually happen in the morning while I am at work. But I do read the therapist's reports, and from what I can tell, they are pleased with her development so far. Of course, they continue to push Hannah to do more, so that she can continue to develop. Needless to say, I am so very proud of Hannah and the progress that she has made so far in her short-lived life. 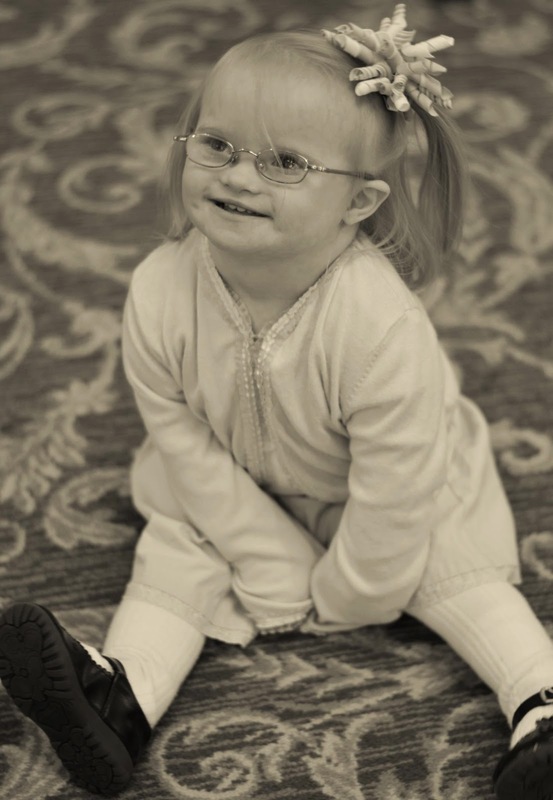 Just because she has Down Syndrome does not mean that we have to sit back and resign ourselves to a hopeless future. I have every intention of helping Hannah reach her full potential as she continues to grow and mature. She has been such a blessing to us. She is such a happy child (most of the time, except for when she is tired). At times, she is about the only one that is happy to see me come home from work. She is very playful, and she likes to play with all of her brothers. And they like to play with her. It's been a tremendous blessing to see how the boys get along with her. Words can't truly express how proud I am of her and how much I love her. I find it so refreshing just to be able to pick her up and give her a hug. She is the only one of my kids that will allow me to do that any more (and yes, I still can pick up and hug all of my kids, should I choose to do so). I love to see her laugh. I love to see her try so hard to do new things. I love to see her show love to her brothers and to her mother. I love her to death. So, Happy Birthday, Hannah! We love you so much!!!!! The last blog post that I made was back in September, days after a bad call determined the outcome of a football game. In that post, I asked why there was such outrage about this bad call, considering that it only affected the outcome of a GAME. Yes, only a game. It had no bearing on the life of anyone outside of the 2 sports organizations playing in that game (unless people were wagering money, then it had an effect, depending on how they wagered). Anyway, the press went berserk about this bad call. They wanted the regular refs back and wanted the league to give them anything that they asked for. This was all that the press (both sports press and regular news press) seemed to talk about for days. Everyone was a critic about the NFL commisioner, and how he mismanaged this whole referee situation. He was incompetent. He needed to step down. He was ruining football as we know it. Yet, not even 2 weeks prior to that bad call, something much more important happened on the world stage that could have a much larger effect on this country. That was the attack on our consulate in Benghazi, Libya. In that attack, several were killed, included our Ambassador to Libya. We were attacked on the 11th anniversary of 9/11. For many days, we were told that this attack happened because of some obscure video on the internet that insulted Mohammed. We were told that those who attacked our consulate were not terrorists. We were told that this was not an organized protest. We were told that we need to be more tolerant and not insult the prophet of Islam. We were told how it was the intelligence community's fault. We were told how it was the State Department's fault. Some even seemed to indicate that somehow it was Romney's fault. I am sure the President was even trying to figure out how they could blame President Bush for what happened. And now, what we find out today, is that the administration knew what had happened, mere hours after the events of that fateful 9/11 afternoon and evening in Libya. They had intelligence that there was trouble in Libya. We now have e-mail evidence that the administration knew what was going on, almost as it happened. They have e-mail evidence of the group who took credit for the attack on our consulate. And yet they have lied to this country for the last 42 days about the events of that day, and they continue to lie to us. This is something worthy of our outrage. Yet, the media chose to be outraged at Gov. Romney for correctly calling this an act of terrorism. Where was the outrage from the media when our consulate was attacked and US citizens were killed? Where was the outrage when the President and his people tried to blame this whole incident on an unknown video about Islam? Where was the outrage when the President blamed this on everyone but did not take any responsibility? Where is the outrage that the President went out of town on a fundraiser, mere hours after these events, knowing what had happened? Where was the outrage when Hillary Clinton fell on the proverbial sword for this administration and the President let her do it, knowing that it should have been him? Where is the outrage that the President still has not come clean on this? Where is the outrage at a President who cannot, and will not, tell the truth to the American people about what happened on that day? Where is the outrage at the now-public e-mails, that indicated the administration knew what was going on, yet decided to tell the American people a false narrative of the events of that day? Isn't this just a little more important than the outcome of a football game? Isn't this more important than what the Kardashian family is up to? Isn't this more important than who various Hollywood celebrities are going to vote for? In other words, why does the media choose to cover all of these secondary news stories, instead of covering a story that involves the security of our nation? Simply put, they are covering for the President. They want him to be re-elected, and they will do anything that they can to stifle news that does not put a positive light on the President. Unfortunately, some still fall for the media narrative. Thankfully, more and more people have figured out the media agenda, and they are choosing to ignore it. John C. Maxwell has said that leadership is taking more than your fair share of the blame and less than your fair share of the credit. This is something that our President has yet to learn. He continues to blame his predecessor for anything that goes wrong, but he is more than happy to take credit for other people's work. That is not what this country needs in a leader. We need a leader who we can be proud to follow, not a leader who tells us that we need to be proud to follow him. President Harry Truman once said that "The buck stops here." Maybe that is a lesson that our President needs to learn. The thoughts and opinions of Adam Matesevac - a husband, father of four, one who enjoys sports, and has a passion for politics. This is not a blog for those seeking a liberal or moderate view. I am a proud conservative, and I am not ashamed of that. We can learn much from what happens in the worlds of sports and politics. This blog is my way of expressing my opinions of the events going on around us on this spinning planet that we call Earth. Bible, Math, Politics, and More!